For centuries, humans have been drawn to the sea - as a source of food, a means of transportation and an enigma that has captured the imagination. Its allure has driven artists and poets to romanticise about its many mysteries and the waters draw scientists to its shores and depths to go beneath the surface in search of strange new worlds. Many of those modern-day writers and explorers are now based at the University of Southampton which has a global reputation for its study and understanding of Ocean and Earth Science. The University’s experts are driven by their fascination for the sea and their shared passion for discovery. Philip Hoare, Professor of Creative Writing at Southampton, was born and grew up in Southampton where the sea became a part of life from an early age. His books Levithian or, The Whale, The Sea Inside and most recent RISINGTIDEFALLINGSTAR all reveal aspects of his lifelong relationship with the sea and his encounters with his beloved Cetaceans – whales, dolphins and porpoises. Rachel Mills is s Professor of Marine Chemistry and Dean of Natural and Environmental Sciences at the University. Unlike Philip, Rachel came to the sea as a scientist and whilst she had visited the coast at times during her formative years, she wasn’t fully aware of oceanography until she completed a module on the subject as a Chemistry student at Southampton. Philip and Rachel recently met for the first time at the National Oceanography Centre Southampton to discuss their fascination for the sea and their fears for its future. 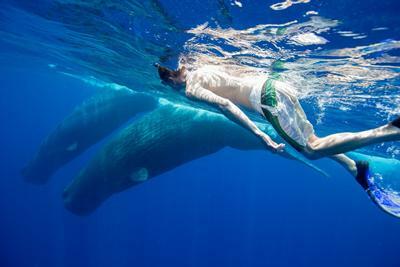 With thanks to Andrew Sutton for the image of Philip Hoare swimming with sperm whales.